So, I’ve played with Twitter and I think I might be missing something. Is it just quick musings from anyone and everyone? Hope so or I’ve really got a lot of catching up to do! I’ve been looking at the plans again and trying to visualise our new upstairs, again. I think I can see it kind of. My next goal is to organise my pinterest page so decorating my lovely new space will be a breeze. That’s the theory anyway. I have 2 boys who are in gamezone heaven since we moved the tv, x-box and chairs into the big room at the back. F hasn’t even taken his coat off. I like that we are all in here doing our own things together. I don’t like that we are all in our own wee techno worlds so I’m taking us out for a dog walk to check out the new obstacles in the little park near us. Funny,the boys don’t seem keen! I’ll save pinterest for later. 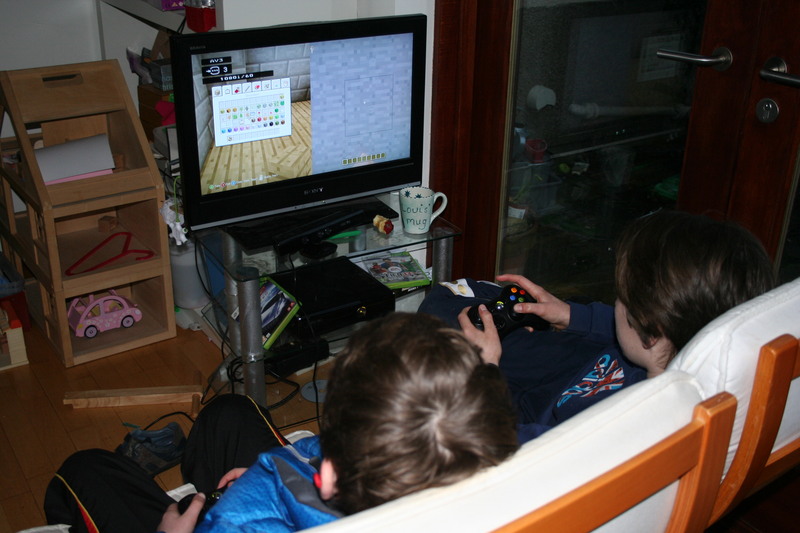 has minecraft invaded your house yet? you have got twitter sussed, I don’t tend to tweet but follow people, go onto philip schofeilds web site he has a good guide for tweeting http://www.officialphillipschofield.com/news/2011/04/28/phillips-guide-to-twitter/1755 I follow him and he is quite a good one to see how it works – goes back to days of watching him in the broom cupboard!